I’ve learned to stay positive in uncertain times…when it comes back I always feel silly for stressing lol. Picking my spots. I didn’t touch the Yen. USD made some confident moves. Looking good going into next week. The simple explanation based on facts is this… As price was trending down, it hit a lot of demand, but it was temporary and the selloff continued. Technically, as VSA teaches, the result candle after the strength does need to close higher…or bullish as I say, to actually confirm the sign of strength. So it was not technically confirmed. I’m not big on VSA definitions when I do my analysis because people can interpret names. I’d rather just say what actually happened lol…but when you say bull trap, I think of a fake breakout to the upside, or some sudden up move maybe on good news, that gets sold into and becomes a top…trapping traders who went long. Hope that helps. Cool you are putting the time in. Post questions anytime. thanks pete that cleared my doubt, still learning, i will post again with chart if i have more question. what do you think about above chart is VSA failure? Or we have to wait a confirmation to get long? for me i think it is a bull trap after high volume breakout. I chose EU and EJ, because on these pairs that 5M volume was the highest volume this week for me, and there was no news or anything at that time of the day, so it was definitely smart money shopping. I entered on the EU after that NS sitting on the 14 EMA and on top of the AR, and on EJ at an other NS after the 61.8 retracement, which bough in higher volume. I was hoping a quick upmove during the news, but most likely smart money used it to get out of the positions, because price didn’t really move after reaching that level on the picture, so I exited aswell. Although it might go up higher. It was good to see such clear setups appearing more and more again. USDCHF was fine hunting too. Wish I hadn’t slept in this morning. Another obvious setup, this time on Gold, which is often this clear. Extra high volume at H1 61.8 fib zone, I entered at the NS marked, because gold tends to just start moving continously, and not giving an AR, or giving it very high. I closed 1/3 of my position at the first high volume which closed bearish, moved to breakeven, and now manually trailing my stop after the price from about 25-30 pips. It looks like the only way I could trade was through FinFx… but they no longer accept usa clients. Tallinex accepts US clients. When FinFX decided to stop working with US clients, they transferred all of us to Tallinex. To be honest I think they are related companies. The daily confirmation email showing all the trade activity is exactly the same, same liquidity providers, etc. I’ve had no issues with them and more importantly I get to trade Gold and Silver with No FIFO. 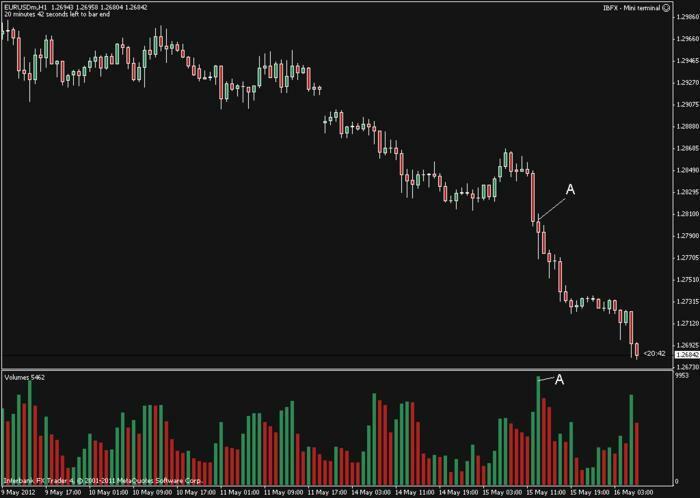 Hey last night I saw what looked like textbook accumulation on a 5-min chart EUR/USD. At least an 80 pip down move halted by stopping volume. We see in the box what I thought to be an accumulation range. There were many instances where wide spread down-bars with ultra high volume and then bullish reactions. Basically I saw high volume near the bottom, and MUCH lower volume near the tops. But price broke through the bottom and continued before pretty much drifting off for the night. I didn’t see any high impact news around this time that would have caused the opposite direction. Daily and 4hr charts look pretty inconclusive for trend. Should I be looking at market cycles from the 1hr chart’s perspective ONLY, because it looked like classical accumulation initiation on the 30-min chart.? Can anyone give some light to this? Chart attached below. Been there, done that. 400 bucks, worth it. Do you need to spend 400 bucks, no, but then do you need to buy 400 dollars worth of books? I have tried the indicator methods, and I do use a few, but i don’t go over board. Stick with VSA and Wyckoff by reading and practice, and these videos are a good mentoring tool. 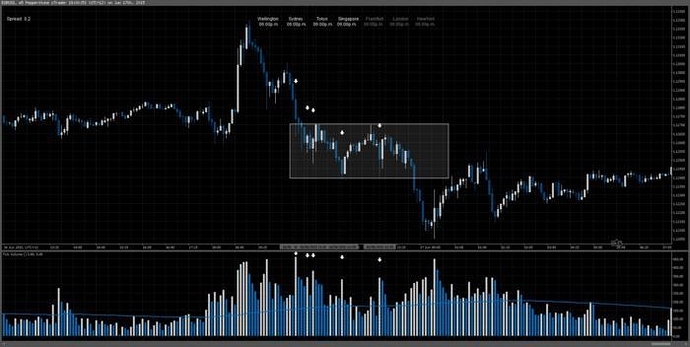 Forgot to mention, learn from Babypips FX course, it’s free and important, it will teach you the basics and fundamentals of FX then top it off with VSA and Wyckoff. You’ll get it after a while. It’ll become second nature. The dotted volume bars are far from ultra high volume. There are 5 higher volume bars before, than the 2nd, 3rd, 4th and 5th bars. The 1st one is okay, but it continued down with medium volume, so most likely that was a major selling. Also compare the highest volume for the day with the prevoius couple days highest volume on the same timeframe. Maybe it looks like the highest, but putting it in bigger prespective it may be only medium-high. Also look for the bigger picture first, don’t just focus on 5M. EU on the H1 is extremely choppy now, and all this greek and USD rate things are not helping it either. It can move unexpectedly. Check those setups I posted in the last few days. A proper setup is usually clear like those. I use all time frames, the smaller time frames will be more choppy but good indication of what is going on in the present. I see some accumulation in the box area indicating there was still buying going on or absorption before the next drop. The up bars after the down bars indicating accumulation or buying. But the trend continued down. Of course you need to go to the higher time frames to verify the trend. Great thank you for the info! I’m using FXCM demo for my vol feed…I know I’ve asked this before…yet, for clarities sake, is anyone else using this? If so, do you find it fairs quite well? Hope all are well! Still reading these posts daily! So if the price of gold goes from 1191.5 to 1192.5. How many pips profit is this? hey guys, intro. firstly props to the Man himself for keeping the ball rolling, i check in from time to time and glad things are still rolling. this is my first ever post in an internet FX forum, so, yeah, be gentle! Long EU, GJ, GU (holding small risk tickets from Tues), vs short Au in small right now. trading style is simple enough, re-roll a box or butterfly spread into as much open PL as you dare not take, then leave it pretty much and step away from the margin gas…all best now, Graham. I am always skeptical to VSA, as there is no measurable volume in Forex since it’s a segregated market. VSA is a stock market strategy where volume is accurately recorded. Forex ‘volume’ is actually tick counters, which means how many times a candle changed prices while it was open. I don’t see how volume and candle ticks have a 1:1 representation or anything close to it. I didn’t take the trade because I was busy working but I wanted to point out that the 5 min Signs of Strength gave crystal clear indication of an up-move coming. I will be looking for longs next week if we continue to see accumulation. To the question if does VSA work in Forex and how? For the how I don’t think we will ever know the answer, but as lot of us tested it, the volume works in Forex, and VSA gives very clear signals a lot. Many more times as not, I’d say about 8 out of 10 on average. If you use the system properly.